Due to its non-invasiveness, fMRI is the method of choice today to investigate cortical activations during cognitive tasks. In contrast to the application of PET (positron emission tomography), fMRI can be repeatedly applied to healthy subjects without any health-related risks or complications. 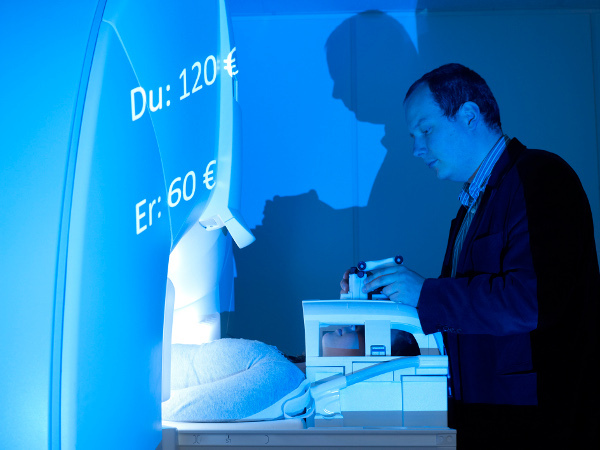 At the Life&Brain Research Center, two MRIs (1.5 T, Avanto and 3T, Trio, Siemens, Erlangen) have been installed which are partly available for research purposes. This allows for simultaneous scans of two subjects during social or economic interactions. For stimulation purposes, we apply very modern equipment with high-quality video-goggles and headphones that can be used in the MRI scanner (NNL, Bergen, Norway). In comparison to conventional projection methods which apply mirrors to show stimuli presentations, the subjects using this equipment feel much more integrated into the presentation and better shielded from the scanner environment. In addition to image- and video material, audio material (noise, sounds and spoken words) can also be presented in the MRI. Therefore the machines are equipped with headphones which have been specially developed to function in the high-frequency magnetic field.